Canva is one of the best tools to quickly design banners and graphics for social media. This tool is easy to use and comes with lots of tools to make banner designing an easy task. Initially, it was launched for the web and later it also brought an iOS app. But, Android users are still waiting to get Canva. If you are looking for best Canva alternatives for Android, you are at the right place. In this article, I will tell you three best Canva alternatives for Android. 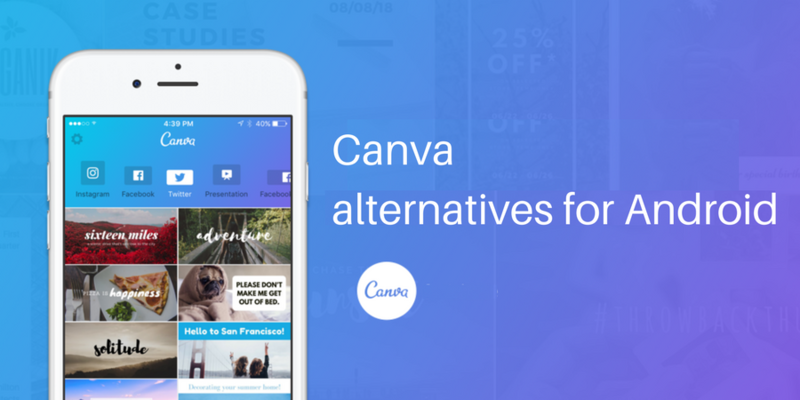 Note: Canva app is now available for Android. So, I don’t think you need to look for alternatives. Canva is the best app for photo editing on the go. As a blogger, I personally use this for making images for my blog posts, social media posts, ads banner and lot more. Download Canva for Android. I already wrote best Canva alternatives to try on the web. Now, this list is for Android platform. This is my favorite choice and I use it actively when I want to create a graphics quickly on my Android phone. This is also easy to use and comes with lots of editing options. It also has a section for Royalty free photos to include the graphics. You can use it to create graphics for Facebook, Instagram, Twitter, Pinterest, Tumblr, Google, Linkedin, YouTube and lots of other social media websites. Not just social media photos, you can also use it to design Facebook and Google ads. Sprightly is another nice Canva alternative. This app is from Microsoft that brings the power of Office Lens and Bing right into the app. It also allows you to scan documents and notes. You can create photos for different social media sites, collages, posters and more. You do not need to hire expensive designers for these things. Befunky is an online photo editing tool that lets you create images for social media or blog posts. Just like Canva, it also allows you to select from different pre-defined templates and quickly edit to create your photo. You get many templates, design elements, colors and fonts to choose from. This tool has basically three modes: Photo Editor, Collage Maker, and Designer. You can play with any of these modes. For social media posts, try the third one.Best thing about the tool is that templates are categories by theme including travel, food, holidays. You can also select the social network for which you want to create the post to get the optimal size. If you do not want to use Canva, you must check this tool. The best thing about the tool is that templates are categories by theme including travel, food, holidays. You can also select the social network for which you want to create the post to get the optimal size. If you do not want to use Canva, you must check this tool. This tool is free with ads and offers only 125 photo effects in the free version. If you want high-resolution photos, additional graphics, and more effects, you can subscribe to the pro version which costs $4.95 per month. If you do not want to use the web version, there is an app for both iOS and Android. Canva only offers iOS app. Etimat Designer is also a similar kind of designing app for Android platform. It can be used to create different marketing materials including Business card, Flyers, labels, collages and social media marketing materials. This may not be as powerful as Canva, but still worth to try. You can edit images, add text, add shape and more. This tool provides a faster way to create social media images with jus drag and drop. You can also try this tool without registration, but having account lets you save changes. Like other tools, it also offers templates for Facebook, Twitter, and other social media posts. You can use available content including background and icons in your commercial posts. You also get free browser extensions for Chrome and Firefox. This tool also comes with Buffer integration which allows you to schedule social media posts directly from Stencil. PixelLab is also a good app with similar kind of designing experience. You have multiple text options, options to add beautiful stickers, import images, draw, add background and more. Phonto is also a nice app for designing banners, ads, photos, social media banners and more. You can multiple background and graphics. In case you want to try better, you have the option to buy. Fotojet looks the mix of Canva and BeFunky because it has features of BeFunky but the design is similar to Canva. It is clean, fast and easy to use the tool. It offers various design elements which are organized into categories. You can use this tool to create collages and edit photos. It also allows you to use fonts from your system. You can also import your Facebook photos to work on it directly. It lets you share photos on Facebook, Twitter, Pinterest and Tumblr. This tool also offers a pro version with more features, but you can try the free version for most of the tasks. Pablo is also easy to use tool for quickly creating images for social media posts and increase the engagement. This tool has been developed by Buffer. It comes with more than 50,000+ images to use, 25+ fonts, and support for most of the social media platforms. Unlike other platforms, this tool is simple and offers only images and fonts. You can also upload your own images. There are not too many apps that offer similar kind of editing for Android. But these three are worth to try. I personally use Desygner because now I am comfortable on that. You can try other apps as well and see how these work for you. If you have anything to ask or say, you can comment below.